Swimming is an important part of the Australian lifestyle. 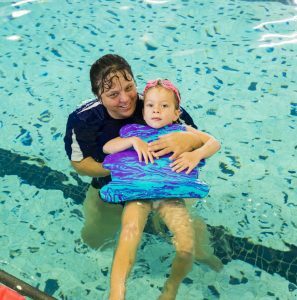 By providing your child with structured swimming lessons you can help keep them safe in an aquatic environment, develop key life skills and ensure they can have fun and enjoy the water with their friends and family. Sherriffs Road Swimming Centre is a family owned and orientated business. We have been successfully teaching children to swim for 40 years. We are dedicated to providing the best possible ‘learn to swim’ program for your family. At our centre we cater for people of all ages and abilities. Babies and pre-schoolers start their journey towards achieving confidence in the water and learning to swim through our early years program. School aged children can learn to swim and continue to refine the their technique through our skills based programs. They can then choose to use swimming for ongoing personal fitness, at our centre, or become involved in competitive swimming. No matter what your age, everyone can become comfortable and safe around water. Using our extensive knowledge base we have developed and offer a systematic approach that is fun and effective. We care about making sure you learn to swim safely, confidently and efficiently (with good style). Sherriffs Road Swimming Centre’s lessons require no ‘joining fees’ or set term periods for our classes. Consistent positive customer feedback confirms that we are providing high quality and affordable aquatic programs for children and adults. We care about what we do, and take pride in doing it well. Our swimming lessons whilst providing fun, most importantly teach participants how to swim safely and with good technique. What do the lessons involve? We offer an effective and systematic approach that is fun and child centred. We cater for all ages and ability levels, from the cautious beginner to the highly skilled and very capable swimmer. Over the years we have taught thousands of children to swim well with many going on to follow a competitive pathway achieving success at state and national championships. We care about making sure your child learns to swim safely, confidently and effectively. At Sherriffs Road Swimming Centre we believe that learning to swim well is an investment in your child’s future.